SOUTHFIELD, Michigan, February 6, 2014 (ENS) – Driven by stricter European emission standards, worldwide production of electric vehicles is forecast to rise by 67 percent this year, according to IHS Automotive, a business information analyst. Total production of pure electric models and plug-in hybrid electric vehicles is projected to increase to more than 403,000 this year, up from more than 242,000 in 2013. The growth predicted for 2014 follows the 44 percent increase in 2013, based on data from the IHS Automotive Hybrid-EV Portal. The IHS report points out that the huge increase in EV production this year contrasts with the 3.6 percent rise in global manufacturing of all motor vehicles expected in 2014. The Europe, Middle East and Africa region will account for the largest share of production at more than 40 percent, with the Americas and Asia-Pacific each making up about 30 percent. This year will offer more choices for consumers who are considering buying EVs. Battery electric vehicles from the German automakers, including the BMW i3, Volkswagen’s e-Up!, the Mercedes-Benz B-Class Electric and Audi’s A3 e-tron plug-in hybrid, are planned additions to the current lineup of EVs in 2014. More product availability and greater choice will help widespread adoption of EVs, the report states. The global installed base of EV charging stations is set to reach more than 1.1 million units worldwide by the end of this year. ”Although most of the installed base is for domestic charging, almost 35,000 charging stations are expected to be installed this year in the public or semipublic domain,” Scott said. The domestic charging market, typically an AC domain, will be shaken up this year with the introduction of DC chargers, predicts the IHS Automotive analysis. This year will see the worldwide rollout of public “trio” chargers that comply with the AC-Type 2 Mode 3, DC-CHAdeMO and DC-CCS standards. These public infrastructure solutions have complete compatibility with all EV models, although costly for charge-station owners. Trio chargers are large metal boxes containing power electronics and three connector types. While they offer more charging flexibility, they reflect uncertainty over the future direction of charging standards. Business conditions in 2014 will be tough for companies that manufacture AC charging stations. Pricing for domestic AC charging stations is decreasing and starting to reach commodity levels. Margins are low and are expected to become smaller, resulting in an unviable business case. “With margins so small and AC domestic chargers being such low value-added products, it’s difficult to see a sustainable future for many AC EVSE manufacturers, which means that consolidation in the market is likely this year,” Scott said. In 2014 and the coming years, automakers will deliver concept and production EVs with large batteries that have capacities of approximately 40 kilowatt hours (kWh), which equates to at least a 150-mile range, IHS predicts. Lithium-ion battery prices are decreasing as a result of the price war between LG Chem, the battery supplier to the Chevrolet Volt; and Panasonic, the battery supplier for Tesla’s Model S, Scott explained. Because of this, automakers can afford to put larger batteries into their vehicles and reduce range anxiety. “Less than $250 per kWh for a lithium-ion battery is the generally accepted price level for these batteries to become mass market in automotive – a price we will get closer to this year,” Scott said. “The addition of Samsung SDI – the battery supplier to the BMW i3 and Fiat 500e, and potentially the new battery supplier for the Tesla Model S and X – will also help drive battery prices down,” he said. Suppliers and original equipment manufacturers are expected to offer more energy-and fuel-saving technologies this year. Ford has presented its C-MAX Solar Energi Concept, which uses a solar panel on the roof of the car. With the help of a solar concentrator, enough energy can be drawn from the Sun in a day to equal a four-hour battery charge equal to 8 kWh. Bosch has developed a new start/stop system that shuts off the engine when the car is coasting, delivering fuel savings of up to 10 percent. Technologies like this could bring petrol-powered vehicles closer to the energy-saving benefits of hybrid electric vehicles. Public charging-station operators and owners will continue to struggle to make a profit on EV charging in 2014, says the IHS Automotive report. Although electric vehicle production is now closer to reaching the expectations of five years ago, there still are not enough grid-dependent vehicles on the road to generate large revenues from public charging. Operators and owners may reach for other forms of revenue generation, such as advertisements on charging stations using integrated liquid-crystal display screens. In China, 2014 will be important for new energy vehicles – EVs, PHEVs and fuel cell cars – driven by government policy. In Beijing, the city aims to limit new-vehicle sales to curb pollution while simultaneously increasing deployment of new energy vehicles. The city plans to deploy a total of 170,000 new energy vehicles from 2014 and 2017. Beijing will introduce 20,000 new energy vehicles in 2014. 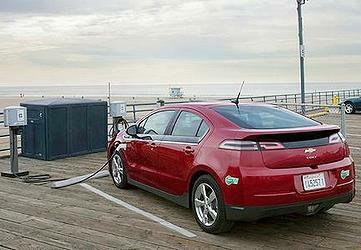 The price of EVs is expected to decrease in 2014, as more manufacturers enter the marketplace. The price of the 2014 Chevrolet Volt dropped, and IHS analysists expect other vehicle models to follow the trend. Although Nissan has announced a slight price increase on the 2014 LEAF from last year, there is a decrease of about $6,000 between the 2012 and 2014 models. Price is the main reason why uptake of these vehicles hasn’t been as high as expected, so incentives are critical if countries are serious about the adoption of such vehicles. In 2014 it may be possible that we see EV legislation or incentives in new regions.